NUnit. Chances are that you know what NUnit and Test Driven Development are, but if you don’t I’ll give you a quick primer. Test Driven Development means that you drive your development from tests. I know I just reversed the order of the words, but lets take a look at what that means 😉 Test Driven Development has a little motto that goes, “Red. Green. Refactor”. The red refers to writing the tests for what you want your code to do before you write the code to do it. When a test fails in NUnit (and other Testing Frameworks), they show up as red. Next, you write the actual functional code to make the test pass (green), and then you refactor the code so it is as clean, extendable, testable, and maintainable as possible. Then you run the tests again to make sure that none fail. If they do, you fix your code so that the tests can pass again. You repeat this process as much as is prudent for the project that you are on. The extra added benefit is that you can feel safe in making changes to your code later. If you have written sufficient test coverage, you can run your tests and if they all pass, then your changes will cause no problems when you deploy. Now, on to NUnit. NUnit is the first unit testing framework that I ever heard of or used, so I have a soft spot for it. You can get started by downloading NUnit from their download page here. The easiest way to get going quickly is to pick the download named NUnit-2.4.8-net-2.0.msi and then just run the install wizard. Once you have everything installed, let’s get started. For a sample, let’s just make a new C# class library project called NUnitExample. Add a reference to nunit.framework.dll that can be found at (if you accepted the defaults on install) at C:\Program Files\NUnit 2.4.8\bin\nunit.framework.dll. /// looks like in the Test Runner. 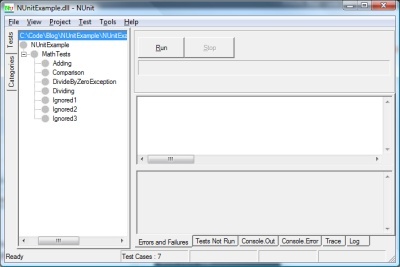 Now, fire up the NUnit Test Runner GUI. It is located at C:\Program Files\NUnit 2.4.8\bin\nunit.exe. When it opens, click File –> Open Project and then navigate to the .dll that was created from the project that you built and click “Open”. 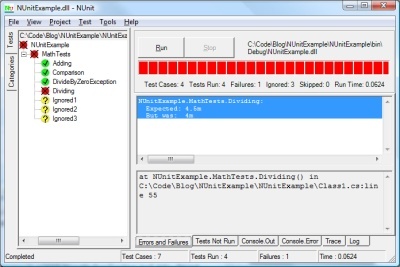 What you see is that the entire test fixture of NUnitExample has failed (the red circle with the X). Parent levels are always shown as having the same success level as the lowest success level below it. You see that Adding, Comparison, and DivideByZeroException passed. No surprise here. Additionally, the three tests named ignored have been ignored because their signatures were incorrect. If you click the “Tests Not Run” tab at the bottom of the runner, you can see why. If you click the “Errors and Failures” tab, you will see why the Dividing Test failed. When you switch back to the NUnit Test Runner, it will have automatically refreshed because the test project has changed. Run it again and the Dividing test will pass and the overall status will be yellow because the lowest level of success in the child tests was also yellow. c:\Program Files>"C:\Program Files\NUnit 2.4.8\bin\nunit-console" C:\Code\Blog\N UnitExample\NUnitExample\bin\Debug\NUnitExample.dll NUnit version 2.4.8 Copyright (C) 2002-2007 Charlie Poole. Copyright (C) 2002-2004 James W. Newkirk, Michael C. Two, Alexei A. Vorontsov. Copyright (C) 2000-2002 Philip Craig. All Rights Reserved. Runtime Environment - OS Version: Microsoft Windows NT 6.0.6001 Service Pack 1 CLR Version: 2.0.50727.1434 ( Net 2.0.50727.1434 ) .....N.N.N Tests run: 4, Failures: 0, Not run: 3, Time: 0.031 seconds Tests not run: 1) NUnitExample.MathTests.Ignored1 : Method Ignored1's signature is not correct: it must be a public method. 2) NUnitExample.MathTests.Ignored2 : Method Ignored2's signature is not correct: it must return void. 3) NUnitExample.MathTests.Ignored3 : Method Ignored3's signature is not correct: it must not have parameters. it must be a public method. it must not have parameters. In a later post, I will look at doing Test First development with a true “Red. Green. Refactor.” feel.